George Barnard has worked with hundreds of individuals to help them make auditory or visual contact with their angels. As a professional hypnotherapist, with some 50 years personal experience of angelic contact, he has plenty of experience to share. This CD contains the secrets that he himself uses to reach the deep alpha levels needed to make contact. Together with the techniques of deep meditation, George takes you on a carefully structured guided meditation into the realm of your very own Akashic Workshop. Of course nobody can guarantee that you will make the break though yourself today, or next week, but it is generally believed that with enough effort virtually all of us can contact our angelic guides. It's up to you to make that effort. There are three tracks on this CD. The first track is a relaxation. This teaches you to relax. You need to practice this track for a week. Track two is deep alpha. This helps you to get into the deep mind state for the last track. Practice this for a week. 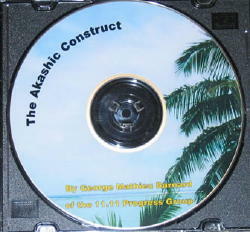 Finally the Akashic Construct. This is fabulous! George Barnard is Dutch by birth, French by descent, and Australian by choice. Since childhood, he has been aware of Spirit Guardians who often guided and protected him. In his career as an industrialist, and later a therapist, these Spirit Friends assisted him in emergencies—from saving lives to rescuing companies from disaster. They seek to make us aware that this unique human-celestial liaison is available to all who seek it and wish to serve.